Hi my friends! It is March already! I hope everyone is having a great start of the year! I recently did a Facebook live with my friend Emily Merrell, the founder of Six Degrees Society which is a women-focused networking group that takes the guesswork out of who you meet while networking. During the live chat, we talk about how I get to start as a fashion illustrator. Tips and tricks for inspiring artists. Hope you enjoy the chat and more importantly learn a few and implement to your career! By the way, feel free join my tribe where I share more tips and classes in the near future! Sign up with your email address to receive fashion illustration tips and new class release! Thank you for join the tribe! Please stay tuned for upcoming emails about being a full time artist, fashion illustration tips and my next illustration class! At the meantime, please keep in touch on my Instagram @rongrong_devoe_illustration. Talk to you soon! Hello everyone! It's that time of year again - my year in review! I am back in my studio from a super fun Christmas with family in Upstate NY. Just two more days until 2018! A brand new year, so many unknowns, so many amazing things can happen! I am beyond excited!! If you had asked the 2014 Rongrong, she would never have guessed how much her illustration career would grow. And she would be thrilled to hear how many amazing experiences she had because of her little art business! I wrote a blog post my first year as a full-time illustrator, you can read it here. First I would love to present some pinch me moments which are some projects I did in 2017 that I have dreamed of for a long time. 1. River Oaks District mural. It was a great pleasure working with the River Oaks District, which is a recently opened premium shopping center for luxury brands such as Dior, Hermes and Dolce & Gabanna in Houston. They tasked me with creating two large murals for their wall. Seeing my fashion illustrations in a huge format has always been a dream of mine, so when the manager called I said yes immediately! You can take a look at this blog post which I dedicated to this project. 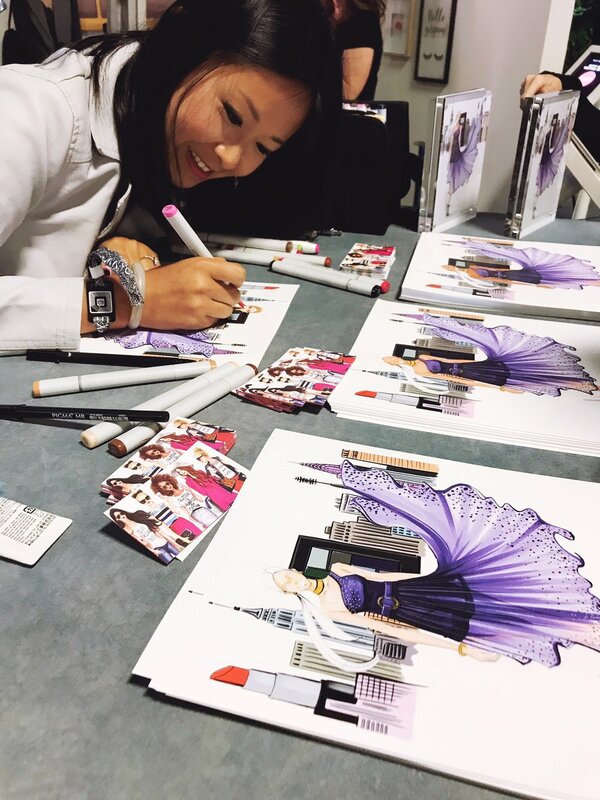 2, Live sketching for Maybelline New York at BeautyCon. This May, I teamed up with one of my favorite beauty brands Maybelline New York to live sketch in their huge booth at BeautyCon. BeautyCon is similar to ComicCon but for Beauty Junkies. Thousands of fans showed up at the Brooklyn Cruise Terminal for a full day of everything beauty, fun activities, engaging panels, and no shortage of swag. It was for sure an eye-opening experience! I was in heaven as a beauty lover myself. I could not be more grateful for the opportunity to work with Maybelline New York. 3, Selling my art at T.J.Maxx, Marshalls, and HomeGoods. Two years ago I was the artist lost in the art section at a T.J.Maxx store pulling her hair out trying to figure out how to get her art into such an amazing store. I needed to make this happen! I went home and researched and sent lots of pitch emails, but no responses. I continued working hard on my collections over the next year and this October my agent sent me an email saying that T.J.Maxx buyers love my work and would love to sell them! I was so excited! A collection of canvas art and a collection of stationery including notepads, planners, and greeting cards are now available in their stores nationwide! Many of my Instagram friends sent me their purchases and I was so happy! Stay tuned for collections of mugs and trays in 2018! It was a dream come true moment! Another highlight of the year was being invited to speak at the Apple Williamsburg location in NYC. I was so grateful to share my journey from working as a concept artist in Shanghai to being a full-time fashion artist in Houston and everything in between. I also taught a quick session about how to draw fashion illustration on the Procreate app using IPad Pro. Many of my Instagram friends came to support me and we had a blast. Read the full experience here. With all the successes in 2017 I need to remind myself of some things to work on in 2018. I am only in my third year in the illustration business and I have made many mistakes along the way. I am grateful for these mistakes as they are a great teacher and push me to continually improve! There are times in which sketching in front of many people can be overwhelming and stressful. However, I need to remind myself I was hired as an artist not just to draw the best art I can but also to bring guests a fun and pleasant experience. My focus cannot just be on drawing, I need to engage the guests, be more talkative and social. That will be my mantra for live sketch events in 2018. 3, Focus on creating a community of inspiring fashion/beauty artists. In 2018, I want to continue building a community of artists who are just beginning their careers as a fashion or beauty illustrator. If you do not follow my InspireToSketch account I recommend you do. I share sketch tips, drawing processes and feature artists that I like on that account. You can leave comments and ask any questions you might have. It is a place where many students who are taking my fashion sketch class and Business of fashion Illustration class hang out! The reason I started this account was to instruct people on how to have a thriving career as an illustrator. I feel like it would have helped me immensely when I started three years ago! I want to share the knowledge I have learned to encourage new artists that they can absolutely have an amazing art career! The world is so big, the opportunities are endless. As long as you dedicate yourself, work hard and be intentional with your business decisions you will be a success, no one should be a starving artist! Before I wrote this blog post, I asked my Instagram followers to submit questions and I included them below. I hope you will get the answers you are looking for! How did you start getting commissions for places? How did you start making money by drawing fashion illustration? I first started receiving commissions by opening an Etsy shop. I made a few listings for commissions such as wedding portraits, family holiday portraits etc. That is what I recommend you start with as well. Alternatively, you can start your own website or online shop where people can view your work and send inquires if they are interested to commission you. Be very clear with your process in terms of how long it will take, how much it will cost, who will keep the copyright etc. How do you know when you are ready to sell? Where is the best place to start selling? I think you can start selling right now! There is always a reason to wait but do not keep waiting and all the sudden a year goes by! Get started now and make mistakes along the way. I opened up my Etsy shop once I had 5 pieces art for sale and continued to add more art as time went on. I recommend a Print on Demand site such as Society 6 as a start because you don’t have to invest in your own printer if you sell prints. I work from my home studio. I do feel lonely occasionally but I am the type of person who enjoys being in my own little world. So working remotely is perfect for me ... but may not be for everyone! Is it possible to make a full time living as an illustrator? And how long does it take to get there? Absolutely yes! You can make good money as an illustrator. It took me about two and half years. That timeline can vary significantly depending on your circumstances. How are your current skills? Where are you located? The first 3 years are the hardest but as you grow your client base and experience the income will continue to grow. The amazing thing about owning your own business is FREEDOM! I really enjoy being able to set my own schedule. I work extremely hard and then, if I need it, can take a month vacation to recharge my batteries. So if you want to start your own illustration business I would look at your current life situation and determine if you can start full time or as a side hustle initially. Full time is optimal if you can pull it off but I would only recommend this if you have a strong financial position where you do not need income for a period of time, upwards of two years. The last thing you want is to put pressure on your creativity, it will only stifle it. If you are in the majority of people and do not have the financial position to quit your job start as a side hustle. Learn as much as you can, invest in yourself. But start today! Do not wait anymore! There is never a perfect time, start doing what you love now! How do you figure out and set goals for yourself? I have a vision board in my studio where I write down what goals I want to achieve for art, business, and finance. Then I break them down into steps. And that’s a wrap! 2017 went super fast and was amazing! I look forward to bringing more exciting projects to my business in 2018. I encourage you all to pursue your passion! At a minimum start a side hustle for something you really love! If you are seriously considering starting a career in fashion illustration or illustration in general, I recommend you check out the courses, How to draw fashion illustration and The business of fashion illustration. What do you think? I hope my message encourages you! Please feel free to leave your thoughts, I would love to chat with you! Cheers to a fabulous 2018 all! Sign up with your email address to receive new classes updates, promotions.